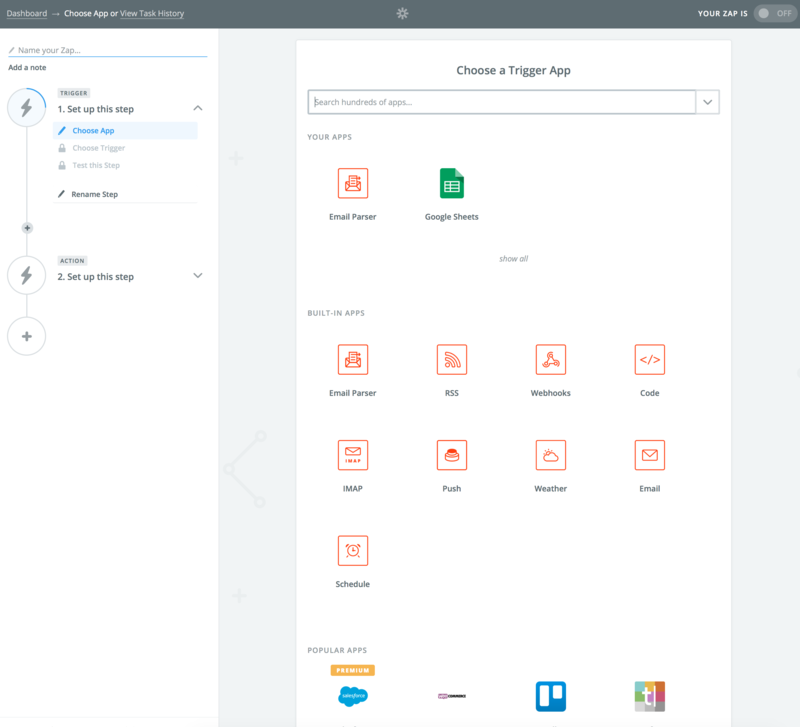 Zapier allows you to connect over 1000+ different apps. 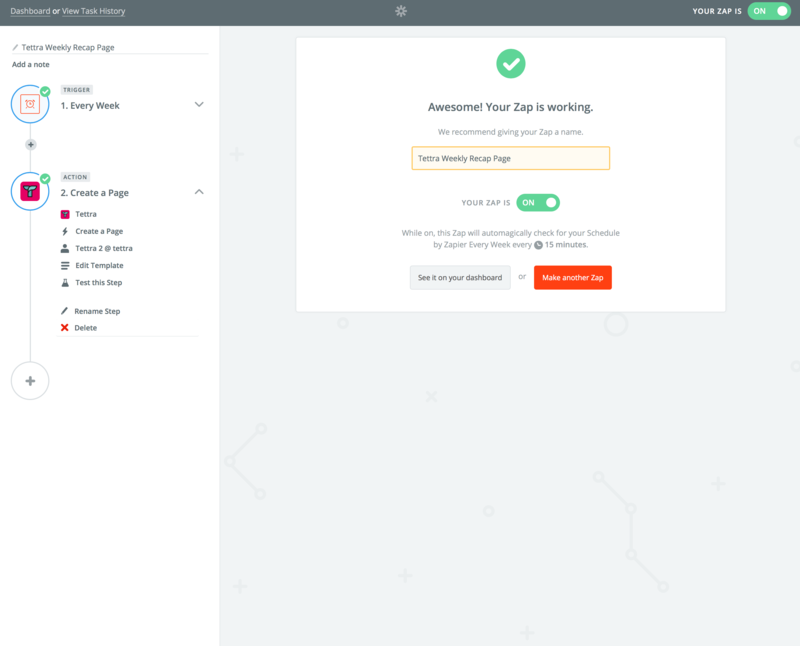 Zapier is all about creating workflows, and automating repeat work. 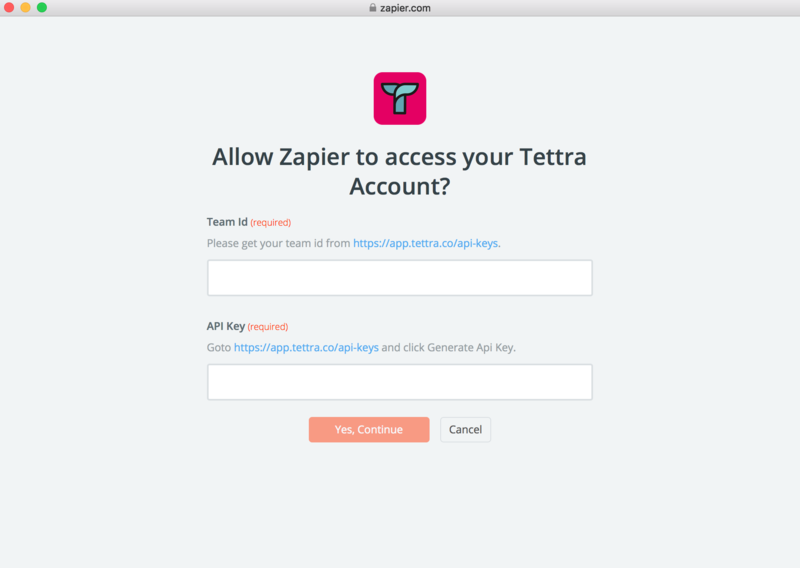 How does the Zapier + Tettra Integration work? 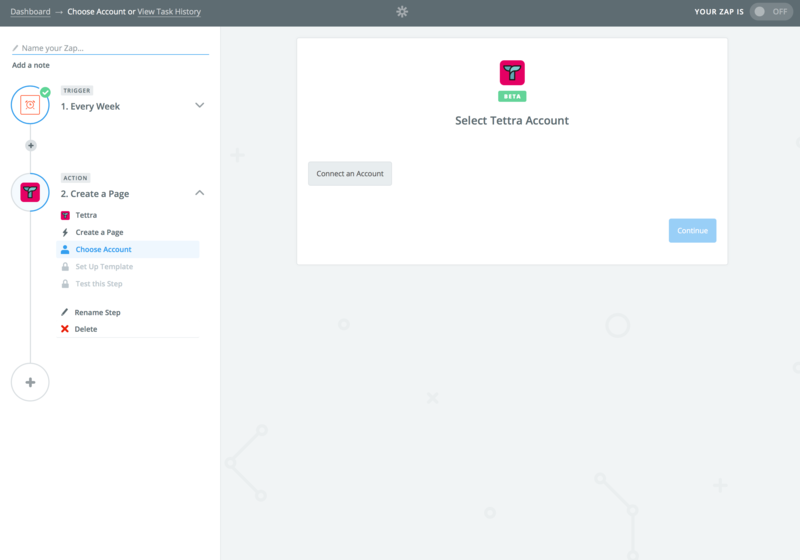 We have created an integration with Zapier, to allow you to automatically create Tettra pages based on certain conditions and workflows. 2. Next "Choose a trigger". This can anything you like. 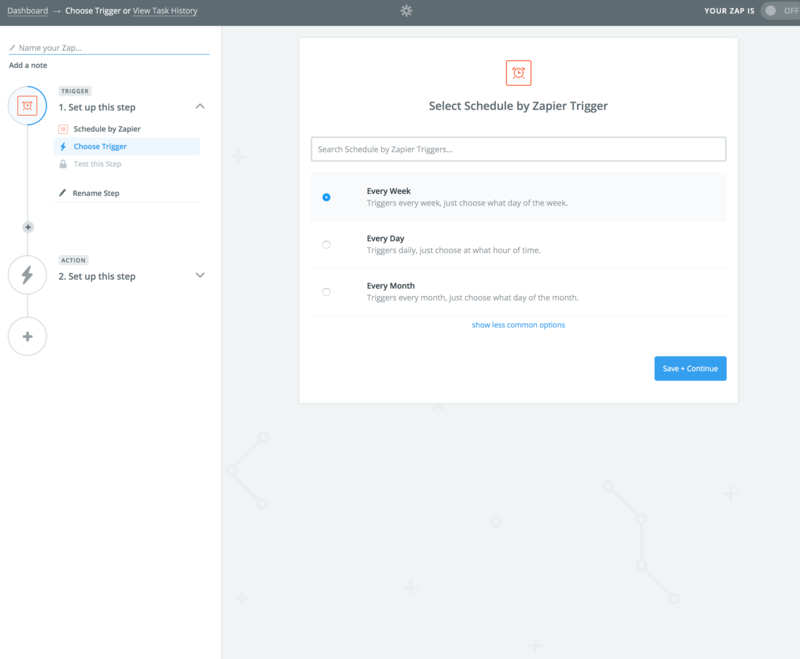 For the example we are going to use a schedule trigger. 3. 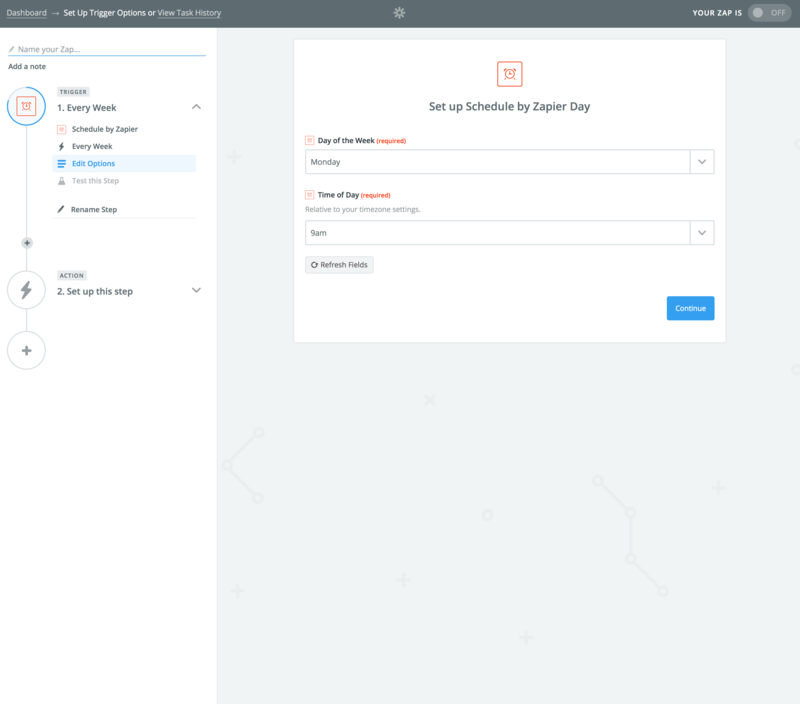 Select the Schedule trigger, then choose how often you would like the trigger to happen. 5. Once the Trigger is all setup. 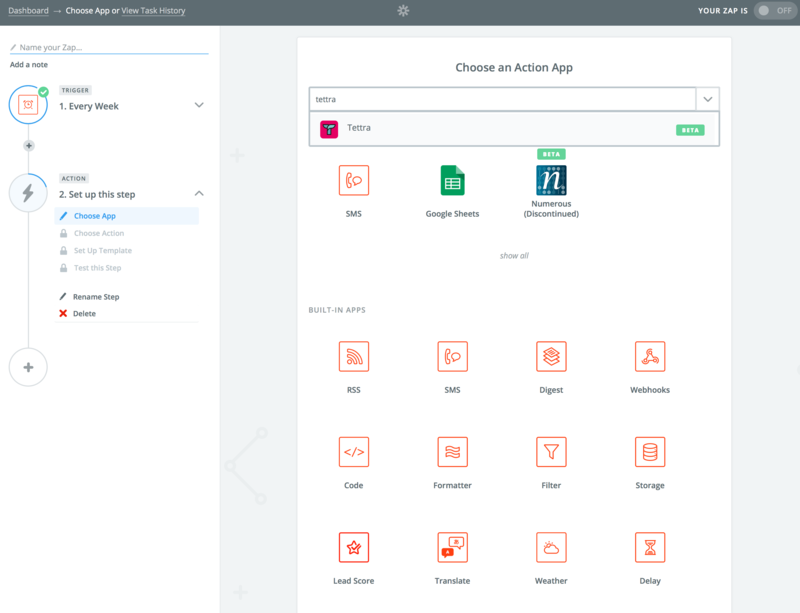 Then you want to Select Tettra as the Action App. 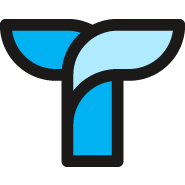 If Tettra does not show up, you have not enabled the app on your zapier account, just reach out to us to get it enabled. 8. 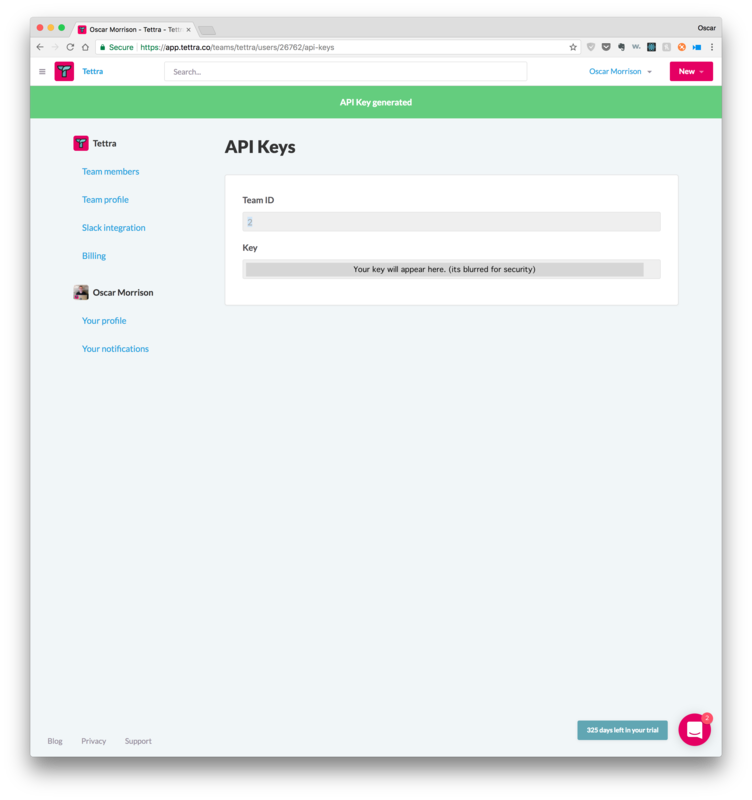 You will be directed to this page, click on the Generate API Key button. 10. 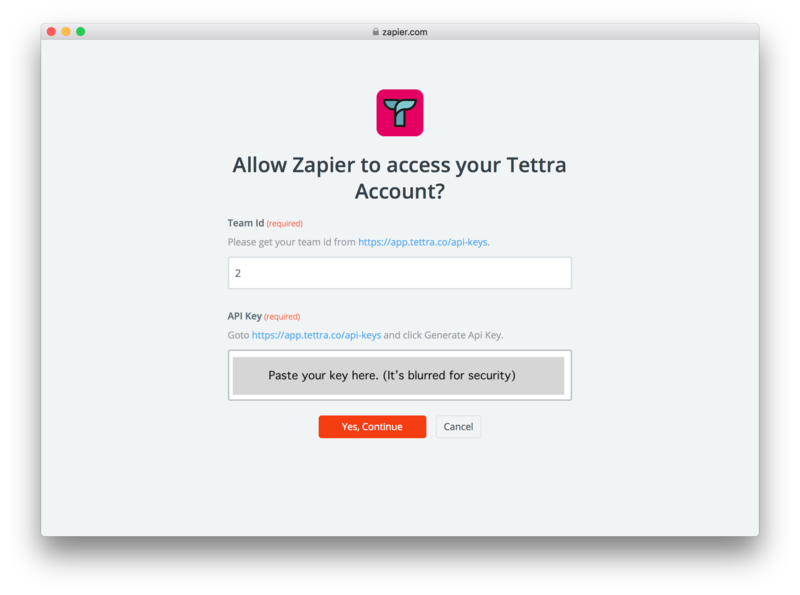 Paste the Team ID and Key from the Tettra Keys page, into the appropriate fields in Zapier. 11. 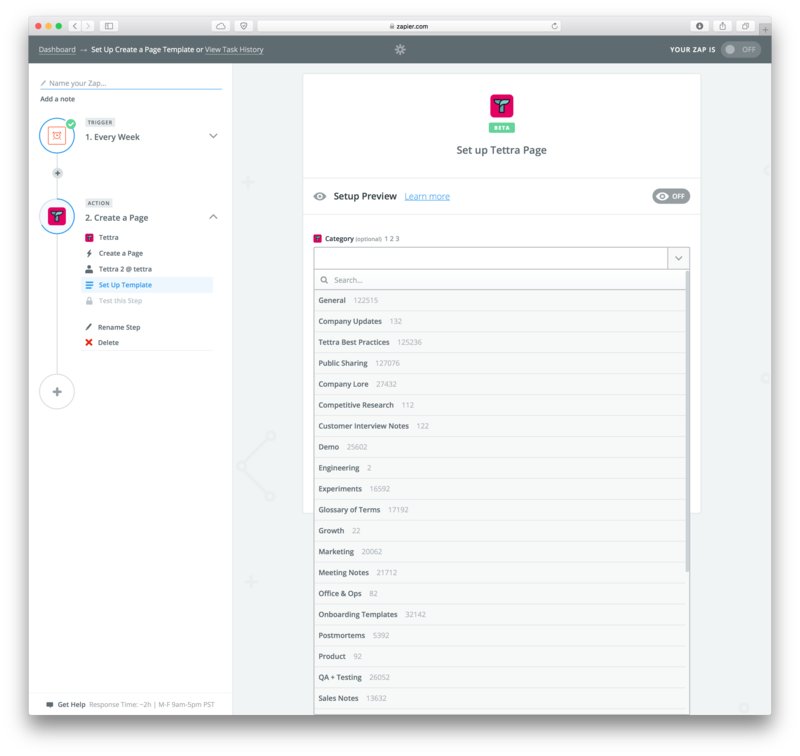 Next (optionally) select a category that you would like your page to go into in Tettra. 12. 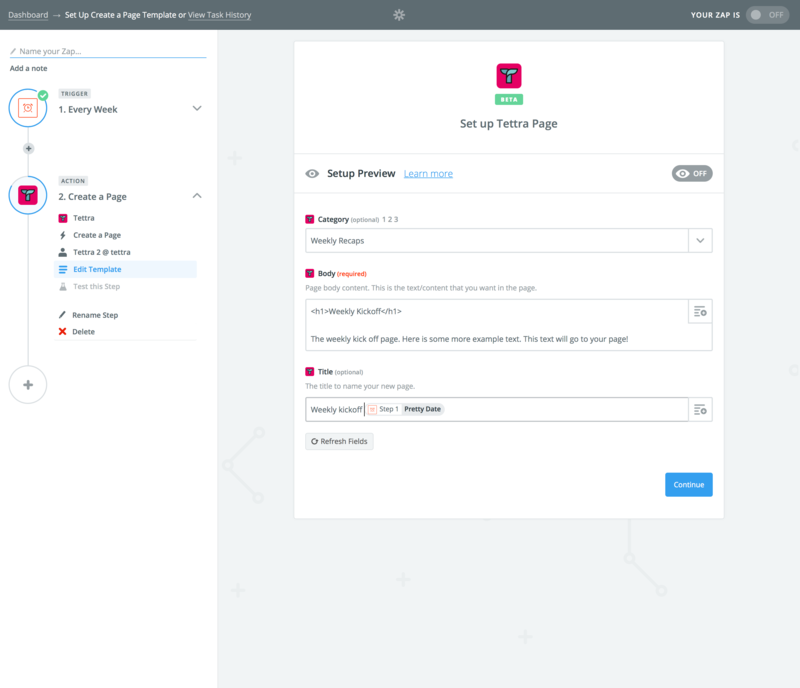 Next choose what you want in the Body of your page. 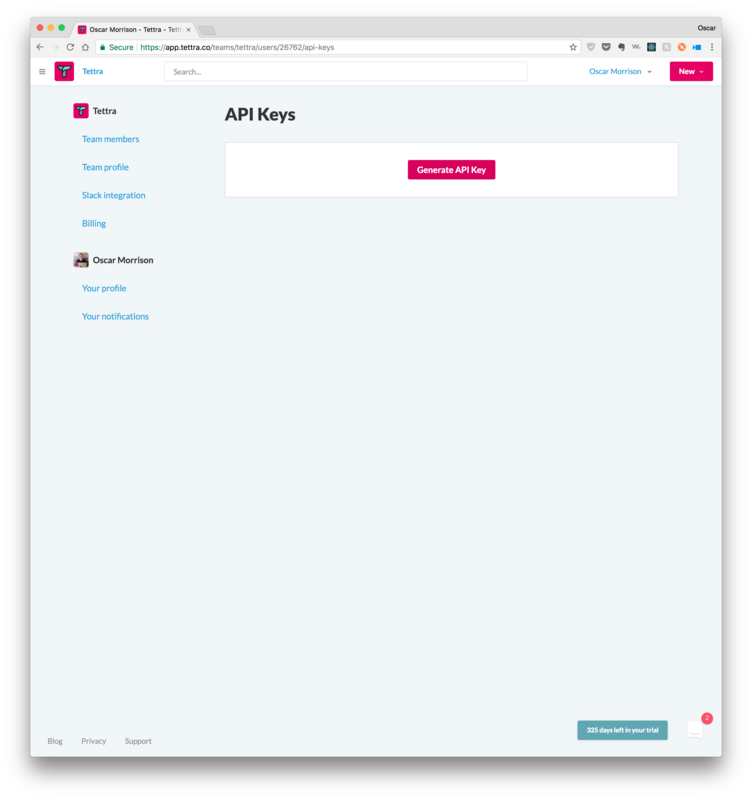 You can use some basic HTML here (such as headers, lists, etc). 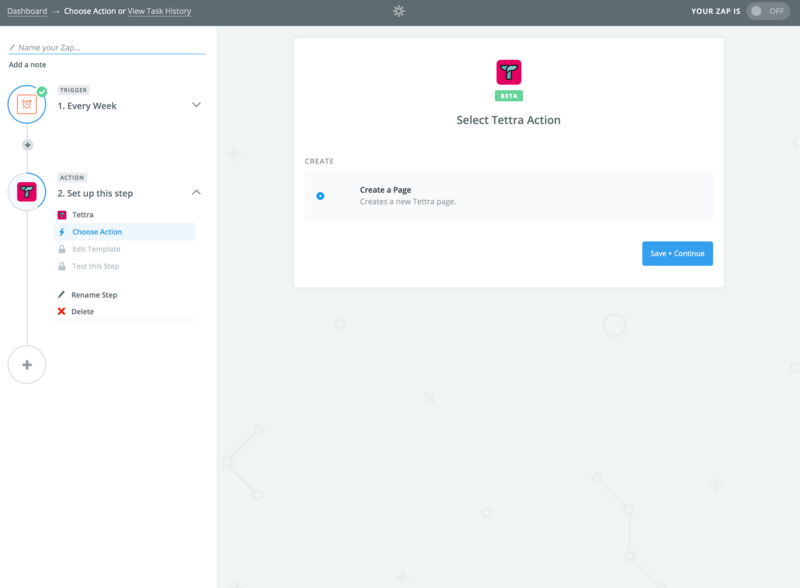 This can be a dynamic source from the action, or can be state. Then choose the Title of the page. You can use some dynamic values in here such as date (in screenshot below). 13. Thats it, you're done! Turn on your Zap, and you are all set, well done!